The holiday decorations are slowly being put away in our house. Our tree, no matter how horribly dry, stays up as long as possible. I like to leave it up a few days past my birthday, which is in the beginning of January, simply because I love holiday decor so much. This sometimes leads to tree disposal battles with the trash men. In mid-January the official collection has passed, so they really don’t want to see my tree out there on trash mornings. OK, without getting on a random tangent about the holidays and trash men, I’m going to come back around to the tree and its fabulous, rich deep green color. I am loving it for winter and even spring weddings! This color creates such an amazing base to any palette. How sweet it is paired with different shades of blues and greens to create this cool color combination. This place setting has me squealing – how fantastic is the mixing and matching? I personally think I may attempt to set my table like this on a nightly basis (it makes me so happy!). The combination of the colors and the textures of both the napkin and the plates is gorgeous. Its understated yet elegant white and green florals are accentuated with the perfect almost mint green color vase and satin ribbon. The stunning letterpress invite in two tones of green is elaborate but not over the top with its pretty pattern. I rarely see these soft blues coordinated with all shades of green, but I love the overall look and feel – elegant, cool soft and rich comes to mind – that these colors create for a wedding. I must say my favorite detail in this color board is the little berries that are on the back of the chair. How delightful! Green is such an underrated color choice for weddings. Thanks for showing how absolutely lovely it can be! Green = peace = fresh. Love this ! WOW! I love th inspiration board! The invite is just darling! Greens and blues are my personal favorite. (When I was real young and living with my parents, I even wanted to paint my room green so it would feel like I was more in the woods.) 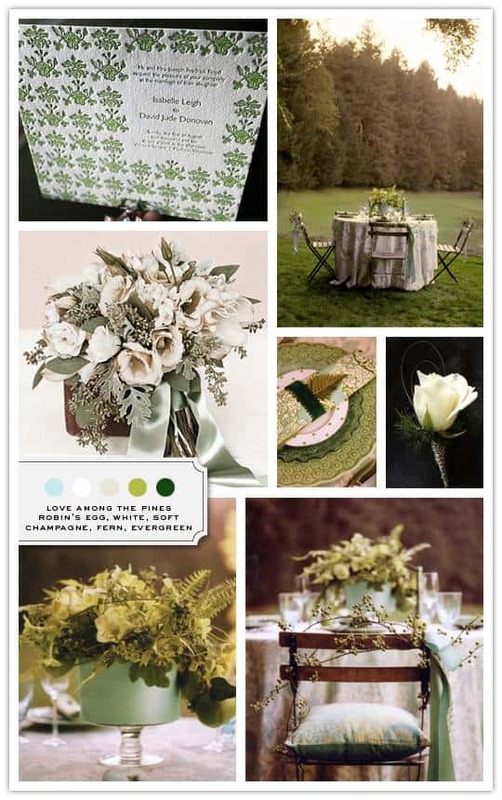 I think shades of greens and blues are fabulous wedding colors. Bring ’em on!